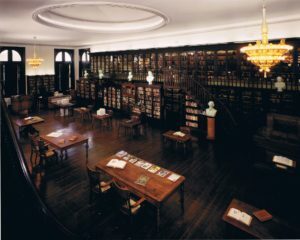 The Joseph P. Horner Memorial Library is a research library, housed in an original 1888 reading room restored by the Society in the 1990s. The library houses more than 50,000 volumes, over three-quarters of which are in German, and is one of the largest collections of German books in the United States. The library also maintains a small collection of newer books, including a substantial children's book collection, that that may be borrowed by members of the Society. The German Society of Pennsylvania’s library was begun in 1817, 53 years after the Society’s founding, for the education and entertainment of its members. From its inception, the library contained books in both the German and English languages, reflecting the fact that English was the official language of the Society from 1818 to 1859. In 1867, Dr. Oswald Seidensticker, professor of German at the University of Pennsylvania and chairman of the Society’s Library Committee, began an Archive of books, pamphlets and manuscripts covering all aspects of German life in America. This collection, now called the German American Collection, contains a wealth of materials documenting all aspects of German American history beginning with the first German settlers in Germantown in 1683, and is especially strong in the history of Germans in Pennsylvania and Philadelphia. In 1962, the library was named the Joseph P. Horner Memorial Library in honor of Joseph Horner, a founding member of the Philadelphia Orchestra, who left a generous bequest of $300,000 to the library. In the 1970s, the Society acquired the library of the defunct National Carl Schurz Association. This collection, focusing on late-19th and early 20th century German and German American history, complemented the library’s existing holdings. In addition to books, the library houses sizable collections of 19th century German newspapers printed in Philadelphia (on microfilm), periodicals, pamphlets, and manuscripts. In the 1990s, a project was undertaken to catalog the collections and restore the library space. The majority of the library’s holdings are now accessible through the online catalog; however cataloging of books, pamphlets, and manuscripts is ongoing. The library is open Tuesdays and Thursdays from 10:00am - 4:00pm, or by appointment. Please call 215-627-2332 or email the librarian at librarian@germansociety.org to schedule your visit. Before visiting the library, please read through our Library Use Policy.